Don’t be afraid to make these flaky French pastries at home. As long as you allow yourself plenty of time, they’re fairly straightforward, and ideal warm from the oven with salted butter and jam for breakfast. 1 Cube the 30g butter and put in a food processor with the salt, flour and sugar; whizz for 1 minute, until the butter is incorporated. Tip into a bowl, make a well in the centre and add the yeast with 100ml warm milk. Leave the yeast to dissolve and activate for a few minutes, then pour in the remaining 200ml cold milk, mixing quickly with a knife to form a soft dough. Knead for 2-3 minutes, until just smooth, then shape into a flat 20cm square. Wrap in cling film and chill for at least 4 hours, or preferably overnight. 2 Put the 250g block of chilled butter between 2 large sheets of greaseproof paper. Use a rolling pin to beat and roll the butter into a flat 15cm square; keep the edges straight. Chill for 15 minutes. 3 On a lightly floured surface, roll out the dough to a 30cm square. Put the butter in the centre of the dough at a 45˚angle (so one of the butter’s points is facing you). Fold the corners of the dough over the top of the butter, so the points meet in the centre like a parcel. Pinch the edges, flip it over and gently pat down to seal in the butter. Wrap in cling film and freeze for 10 minutes. 4 Roll the dough to a rectangle about 20cm x 50cm. Fold the top 1 / 3 down, then the bottom 1 / 3 up, like a letter, brushing off any excess flour. Wrap in cling film; chill for 30 minutes (or freeze for 10 minutes). Unwrap and place the dough in front of you with the folded edge on the left. Repeat the rolling, folding and chilling process twice more. 5 Line 2 large baking sheets with baking parchment. Halve the dough lengthways; cover one ½ with cling film and chill. Roll the other ½ to a rectangle 20cm x 40cm, and 0.7cm thick. Cut into triangles with a 10cm base, 18-20cm tall. 6 Make a 1cm slit in the centre of the base of each triangle. Gently pull out the bottom 2 corners to widen the base slightly, then roll each triangle up from the base towards the tip. Turn the points inwards, making a slight crescent shape. Space about 3-4cm apart on the baking sheets, with the tips tucked under. 8 Preheat the oven to 220˚C, gas mark 7. 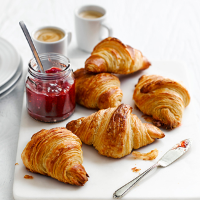 Glaze the croissants with the egg wash; chill for at least 30 minutes. Put them in the oven and immediately reduce the oven temperature to 200˚C, gas mark 6; bake for 15-18 minutes, until golden. Cool on a wire rack before serving.